The scene here is Ramallah, February 2002. The tank is Israeli and the people blocking its path with their hands raised as if under arrest are Palestinians. The photograph is part of a NYT slideshow featuring the work of the recently wheel chair bound Palestinian photojournalist Osama Silwadi, who continues to photograph Palestinian life, albeit from a “new vantage.” His work, both prior to being crippled in 2006 by two bullets that shattered his spine and subsequently, is a testament to the power of photography to document the ever present tension between the tragedy and soulfulness of human life. The image that caught my attention, however, was the one above, which features the visual trope of the tank as the symbol of the totalitarian state. Developed by the British during WWI, the tactical and strategic capacity of the tank was revolutionized by the Germans during WW II, where it became a central element of the military strategy of “lighting warfare” known as the blitzkrieg. Known for the combination of offensive and defensive mobility, as well as its strong fire power, the tank was understood to be a formidable, if not altogether unassailable, weapon of modern warfare, and its technological development was a key feature of the Cold War “arms race.” More important to the purpose here, it was during the Cold War that the “tank” took on symbolic significance as something more than just a military weapon as it was regularly featured as an emblem of state power, typically by eastern bloc nations. The symbolic connection of the tank to totalitarian regimes in particular was marked visually not only by its size, but more importantly, by its panoptic quality: thoroughly enclosed and sealed off from any outside observation or unwanted intrusion, the arbiters of state authority residing inside of the tank are nevertheless in position to monitor and control the outside world with near invincible power. But, of course, as powerful as they are, tanks are not invincible, just as totalitarianism is not unconquerable, and so the visual trope of the tank has developed across time to call attention to the power and capacity of unarmed (and armor less) humans to challenge and even overcome totalitarian regimes, generally in the name of human rights. The first such image to make the point might well be the photograph of revolutionaries standing atop a Soviet tank in Budapest during the Hungarian Uprising of 1956, though no doubt the most famous of such images would have to be of the lone individual standing down a row of tanks in Tiananmen Square. Silwadi’s photograph draws upon the visual trope of the tank as the signifier of totalitarianism in powerful ways, but it does it in a manner that make it importantly distinct from the famous Tiananmen Square image. Shot at a low angle, as if from the perspective of the humans beings being assaulted, Silwadi’s tank looms large, dominating both the frame and the scene it purports to represent. No faces are evident, as the tank functions as the mask of the totalitarian state, and those being imposed upon have directed their gaze away from the camera to the immediate power that challenges and confronts them. At the same time, the gun barrel is directed at the viewer in the manner of a visual demand that encourages identification with the crowd and in opposition to the authority of the tank. 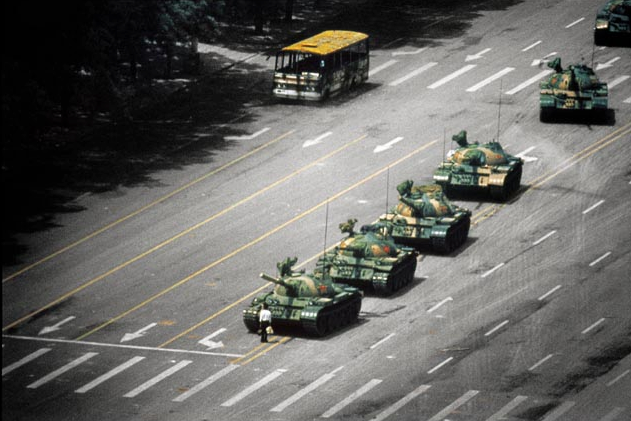 By contrast, the Tiananmen Square photograph is shot from on high and at a distance, invoking an optical consciousness that James C. Scott dubs “seeing like a state.” The viewer is here insinuated as a distant observer of the scene and not an immediate participant in the drama that is unfolding. But more, note that it is a lone individual who challenges the authority of the state, and not a collectivity, and so in a sense the viewer of the image is encouraged to identify with the scene as a liberal individual. As we have argued elsewhere and extensively, the Tiananmen Square photograph activates a cultural modernism that displaces democratic forms of political display and opposition (remember that the protests in Tiananmen Square included thousands of students and nearly a million protesters in all who had organized in various groups) and plays to western conceptions of individualism and apolitical social organization. Thus, while the photograph of a man challenging a tank can function as a progressive celebration of human rights, it also risks limiting the political imagination to narrowly liberal versions of a global society. Silwadi’s photograph confronts this logic by reinterpreting the visual trope of the totalitarian tank and reminding us that what is at stake here is not just a challenge to universal and liberalized human rights that can be observed and contested from afar, but that indeed we are all implicated in and by the presence totalitarianism wherever it occurs … and not just as individuals but as citizens in a democratized, global public culture. cross posted from No Caption Needed.